Science and Technology in Partnership. No-till farming, also known as direct seed, is the direct placement of seed and fertilizer into undisturbed soil and residue of the previous crop. 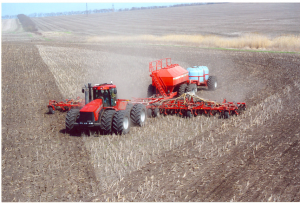 Some use a two pass system where the first pass is used to apply nitrogen and the second pass to seed and apply starter fertilizer with or directly under the seed. No-till is the most extreme example of conservation tillage, defined by the Conservation Tillage Information Center (CTIC) headquartered at Purdue University as any tillage system that leaves at least one-third of the crop land covered with crop residue after planning. Other examples of conservation tillage include strip till and ridge till used for corn. No-till cropping systems cut the use of fuel by more than half by eliminating the multiply passes historically used to incorporate crop residue into the soil, control weeds, and prepare a seed bed. It is possible using no-till for agronomic crops such as wheat, corn and soybeans to farm with a sprayer, planter and combine harvester. Other advantages of direct seed systems includes improvements in soil quality because of more organic matter, more habitat for birds and other wild life because of more cover left on the soil surface, and greater conservation of soil and water resources. Learn about experiments showing that cereal grains when under pressure from root disease yield more when planted in paired rows spaced 7 inches apart, with 17 inches between the pairs, rather than rows spaced uniformly at 12 inches apart; and that placement of fertilizer as a band needs to be close enough to the seed row so that even diseased roots can access to the nutrients.